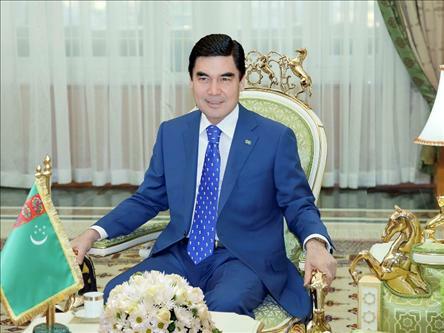 Picking up an cool 97.14% of vote in the recent Presidential elections, newly re-elected President of Turkmenistan Gurbanguly Berdimuhamedov must be pretty pleased with his election campaign. I can only begin to imagine the hours spent knocking on doors, folding leaflets and touring the country to get such a remarkable return. Ilham Aliyev of Azerbaijan was quick to congratulate Mr Berdimuhamedov on his re-election wishing him “good health, happiness and continued success in his state activities as well as welfare and prosperity to the friendly people of Turkmenistan”. Aliyev’s view of “continued welfare and prosperity” of the Turkmen people seems to slightly vary however from that of independent human rights organisations. You can get the picture of the situation from this briefing paper Amnesty International compiled. Either way, the unaccountable leader was re-elected with an incredible 97.14%. I wonder whether it niggles at him that the his predecessor, President for life Saparmurad Niyazov (aka Turkmenbashi) was elected with 99.5% of the vote in 1992? I suspect that Berdimuhamedov will hold up the fact that 7 people stood against him in an election as a sign of reform. The fact that all 7 men were close allies of the President and did not once speak out against his oppressive and dictatorial regime is a mere detail. Implement a brutal and repressive regime that will use force and fear to ensure absolute control. An easy 1,2,3 to election success – Gurbanguly Berdimuhamedov style. 20 years have passed since Turkmenistan gained independence from the Soviet Union, yet despite an economy growing massively through the discovery of massive hydro carbon reserves the average life expectancy has barely budged. In 1987 Turkmenistan’s GDP was $2,368,660,561. By 2009 this had grown to a whopping $19,947,368,421. In comparison life expectancy has gone from 62 in 1987 to just 65 in 2009. This has been consistently the lowest in the region. At the same time Turkmenistan sits 169th (out of 178) in the Happy Planet Index (an effort to measure people’s ‘happiness’) and has one of the worst human rights records in the world. the UN has described torture as ‘widespread’. 20 years from independence, but hardly time for a celebration. The language around the war on terror is slowly slipping out of use. Its consequences however, are very much so still part of the contemporary geo-political scene. Whether we are talking about rendition, torture or illegal invasions – the war on terror has, and is still having a major impact on international relations. In this blog however, I am going to focus on a region of the world that is often ignored in western news coverage, but has a massive influence on our foreign policy – Central Asia. I will briefly track the rise of radical Islam in Central Asia before looking at its impact on the contemporary political scene. Soon after independence after the collapse of the USSR, the independent governments of Uzbekistan and Tajikistan faced opposition from small radical groups. The reason I single out Uzbekistan and Tajikistan is not because their situation was unique to Central Asia, but because of the harsh measures they took to counter this threat. From the early 90’s onwards political engagement was severely restricted. Critics suggest that this helped fuel the more powerful radial groups, who were predominantly Islamic organisations. As they developed in numbers and sophistication, they became inter-connected to what we broadly understand today as part of the “international terror threat” (excuse my use of this misleading crass terminology). In response to this growing threat, all the Central Asian republics took the extraordinary step of banning any political organisation based on religious or ethnic origins. A number of small Islamic organisations were forcibly dismantled. As such member dispersed, some to seek support abroad, others to work at community levels. The civil war in Tajikistan (92-97) acted as a calling card for radical Muslims from across the region. After a series of defeats, the mujahedeen (those fighting in the name of their faith) moved across the border to Afghanistan. Approximately 100,000 refuges made their way to Afghanistan, although of course these were predominantly civilians. It was during this period that political activists first made contact with the Taliban and what would later be referred to as Al-Qaeda. In the late 90’s people start returning home and there was a move throughout the region to organise better structured terrorist Islamic movements. The most prominent at this stage were the Islamic movement for Uzbekistan (IMU) and Hizb-ut-Tahir. From 1999-2001 the IMU launched a series of attacks on Uzbekistan looking to oust the political regime. These attacks would often be launched from Tajikistan and Kyrgyzstan. They never took any real strong holds as they faced stiff international opposition predominantly from Russia. In 2004 suicide bombings in Uzbekistan were allegedly masterminded by the IMU. It is from this basis, we can see that post 9/11 Central Asian governments were more than happy to condemn the actions of Al-Qaeda and join the US in their “war on terrorism”. Immediately, all Central Asian republics granted free air-space over their countries to the US and NATO. Tajikistan, Uzbekistan and Kyrgyzstan all agreed to host US forces on their territory. 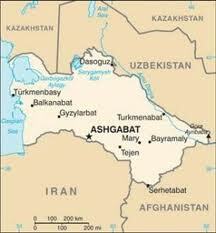 The US set up two air bases, one in Kyrgyzstan and the other in Uzbekistan. Once again, Central Asia is the unspoken stage of world politics. Post the 2003 invasion of Iraq; we can see Russia, China, the EU and the US all fighting it out for influence in the region (for ideological, warfare and energy security reasons). Kazakhstan has sent engineers into Iraq, but the other 4 states have kept their distance. Issues around energy security have become confused and intermixed with issues around the “war on terror”. In 2005, Russia, Azerbaijan, Kazakhstan, Turkmenistan, and Iran all met up to hold a conference on protecting oil and gas infrastructure from terrorist activity. Today, we can still see Central Asia’s role as a “feeder channel” to the Al-Qaeda missions fighting the US/NATO operations in Afghanistan. The growth of Islamic extremist and terrorist groups in Central Asia is directly impacting the stability of the Central Asia itself but also, Pakistan and US/NATO interests in Afghanistan. The volatile Afghanistan and Pakistan borderland is being made even more unstable and dangerous by Central Asian insurgents and it is unlikely real progress can occur without dealing with this issue head on. If we simply continue to fight the insurgents in a militaristic sense, I suggest that these “feeder channels” will continue to replace the fallen men. To really go at the problem’s root causes, long-term planning and effective and transparent regional cooperation will be needed. This is easier said than done when dealing with insular regimes such as Turkmenistan (which remember does have a massive border with Afghanistan). The one thing that can be said for certain, is that Central Asia will remain to be a key geo-political battle ground that will, if trends continue, act as a testing ground for our “fight against terrorism” and global security. The domestic politics of the 5 Central Asian states will continue to have ripple effects on all of our lives and cannot be ignored. Just before Christmas, 2.5 million (80% of all users) mobile phones stopped working in Turkmenistan. Why? The government decided to “switch off” the operation of Mobile Telesystems (MTS) – a privately owned Moscow based phone operator. This left millions of citizens unable to communicate internally or internationally. This is just the latest in a line of obscure human rights violations to have occurred in Turkmenistan. To name but a few of his eccentricities. It was hoped when Berdymukhamedov came to power he would move away from Niyazov’s cult of personality. We can see however that not only is his human rights record appalling (see here for Human Rights Watch letter to him on this issue from last year), but it appears it is erratic as his predecessors. It looks as though Turkmenistan, with Berdymukhamedov at the helm is moving further and further away from the “west” and closer to isolation. There is no real sense of accountability. No one questions why the former Dentist operated on a patient to open a new hospital (no joke – see here). No one questions his legitimacy to do any of the things he has done. This is not good for Turkmen citizens, and it is not good for the international community. Although I have highlighted some of the more bizarre aspect of modern Turkmenistan, it is important to remember it remains one of the oppressive countries in the world. The question then remains, how do the international community try and engage with rogue leaders who shun all traditional forms of diplomacy? For this, there is no easy answer. Turkmenistan is one of those countries you may just about have heard of in the UK. It’s in Central Asia, it borders the Caspian Sea, Kazakhstan, Uzbekistan, Iran and Afghanistan. It was ruled until a few years ago by President for life Niyazov (aka Türkmenbaşy). He has been replaced by former health minister, Gurbanguly Berdimuhamedow. 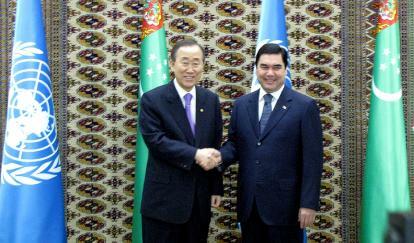 Human Rights Watch has described Turkmenistan as “one of the most repressive and authoritarian” countries in the world. Freedom House has included Turkmenistan in their 2009 “Worst of the Worst” list for social and political freedoms alongside Saudi Arabia and North Korea. There are regular disappearances, reports of torture and harassment of journalist, environmentalist and human rights defenders. You get the idea; it is a pretty dark place. Despite this, the EU is going to extraordinary lengths to court Turkmenistan into trading with them. Why…? Gas! The EU’s flagship energy security project (after deciding they couldn’t trust the Russians anymore) was the Nabucco pipeline. The pipeline is planned to traverse four countries (Turkey, Romania, Hungary and Bulgaria before terminating in Austria). It will be over 3,000 km long and is expected to cost around 8 billion Euros (wait and watch as this figure will inevitably rise). After sorting out some legality this summer, the only issue stopping the project going full-steam ahead is the issue of supply. Who has gas, and is willing to sell it to the EU. Iran is an obvious answer, but the US soon put their foot down there. Iraq looks possible, but the internal fighting between the north and Baghdad may prove to be an issue). Azerbaijan will almost certainly be providing some but does not have the capacity for much more than a third of the pipelines capacity. This leaves the EU without many options other than Turkmenistan. So this is the issue, does the EU provide wealth and fortune to a leader (who keeps his power through natural resource revenues) and secure the EU with another gas supply – this would fulfil their aim of diversifying (partially) their gas supply. Or do they stand up for the Human Rights, development and democracy issues that they are committed to uphold? Is it possible to do both? I feel as though it is important to approach this from a pragmatic position, what action by the EU might improve life for the average Joe in Turkmenistan? We can see that previous attempts to isolate Turkmenistan have not bought about the sort of changes we would like to see. Indeed, no real improvements (other than on paper) have been observed in Turkmenistan in the last two decades (despite what they would have us believe in their hearing at the UPR). It would be very easy for the EU to sit on its high horse and criticise the Turkmens human rights record. This however, would lose our strategic aim of securing their gas supply and secondly would probably make no difference for those who are currently suffering human rights abuses. I am personally not sure what the answer to this is, but my former colleague Neil Endicott has just published a report (http://www.quaker.org/qcea/energysecurity/The_Nabucco_Gas_Pipeline.pdf) arguing that the EU should engage with Turkmenistan. It should do this he argues, by “seeking to engage the Turkmen government in the Extractive Industries Transparency Initiative (EITI), a scheme which addresses resource revenue management issues and provides protected space for independent civil society groups to operate”. This scheme is still relatively young. I feel as though it’s a long shot at best. It is however, by far the most appealing prospect when the other options are to engage and sell out, or to isolate and tacitly accept the human rights situation in Turkmenistan. I cannot see any other option which is more likely to improve life for the population of Turkmenistan. I think it could be worth a shot. The EU, principled or pragmatic? The EU has decided not to renew its arms embargo on Uzbekistan. These sanctions were imposed after the indiscriminate killings in Andizhan in 2005 and were up for review this last week. These sanctions have always been symbolic, as the EU is not a major arms supplier to Uzbekistan. The arms embargo represented the EU’s collective dismay at the human rights violations that have occurred within Uzbekistan that cumulated in the massacres that took place in 2005. On the face of it, it would appear straight faced hypocrisy from the EU to drop this arms embargo despite the Uzbek authorities ignoring the EU’s call for a full investigation into the shootings. If you look a little deeper however, we stumble across a problem that is symbolic for how the EU can hit a brick wall in certain Central Asian countries when addressing human rights concerns. We can see that despite slapping on sanctions there has been no significant improvement in human rights within the country. So how do we improve the lives of ordinary citizens within Uzbekistan? The current presidency makes an argument to say that it is better to look to the future to try and work in a long term cooperative relationship with Uzbekistan. To kick-start this relationship an act of good faith is needed, on this occasion it is the lifting of an internationally embarrassing arms embargo (or in the case of Turkmenistan agreeing to a lucrative gas pipeline). The EU is committed to promoting human rights in its external relations. Can we believe them when they say there is a human rights dialogue that is happening behind closed doors? Call me a sceptic, but considering the importance we currently give to the war in Afghanistan, the need for energy security etc…, I find it very hard to believe that the EU will live up to its own standards and prioritise human rights in its external relations. With Uzbekistan holding significant German military bases and bordering Afghanistan we can see its strategic importance. Equally with the discovery of some of the largest gas fields in the world in Turkmenistan we can see the strategic importance of working with Ashgabat. The sad truth of the matter is that the EU in this case has managed to commit both hypocrisy and yellow-bellied pragmatism. There are a number of member states who were opposed to the dropping of the sanctions but decided not to voice their concerns because of the perceived importance of creating a common position. Not only are certain member states (not to mention any Germanic names) happy to back track on human rights commitments because they see some political opportunities; but other member states (again not mentioning any yellow bellied names) are willing to let them get away with it for the sake of saving face. In the UK we can see the logical conclusion of politics without ideology with no-one but Giddens still talking about a “third way”. Now, more than ever, we can see the importance of value driven politics. The EU has 27 member states and hundreds of millions of citizens. It is not the size of the EU that makes it such a powerful world player, but it is the values that unite us. If the EU does not represent these common values we simply become a large collective with little power. It is the time for the EU and all its member states to stand up and be counted. It is time for us to condemn the Uzbek’s inability to affectively investigate the Andizhan massacres. It is time for the EU to prioritise it human rights agenda.